"White Roses in a Snuff Bottle"
I love roses and these roses are some from one of the beautiful rose bushes that are in our yard. 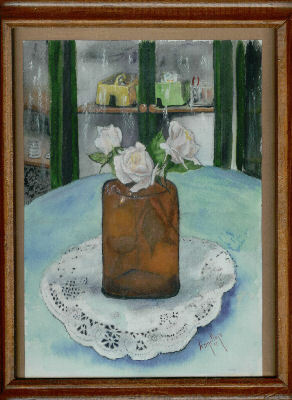 I placed them in an antique snuff bottle on an antique lace scarf on our dining table for my painting set up. 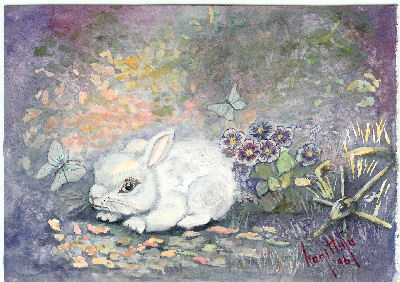 This little bunny and his butterfly friends were �painted with Yarka 1/2 pan watercolors on 140 pound watercolor paper with a cold pressed finish. I had just gotten my set of Yarka 1/2 pan watercolors and of course, I just had to try them out. I was mostly just playing around with no particular object in mind, just having fun. These watercolors are a delight to work with. �They are quite moist and flow beautifully. �A wide range of colors is available individually or in sets and they are reasonably priced.